Tonight’s art-of-running piece was designed on the train home, and was one of those that just kind of presented itself. The natural curve of the canal just to the north of our house had clear potential – and when combined with the grid-system in the Kanda/Jimboucho districts, well there had to be a 4-legged creature in there somewhere. This is actually the 2nd elephant I’ve drawn, the first being my first ever (poor) attempt at GPS art. I love elephants, and I’m very happy with this little baby. 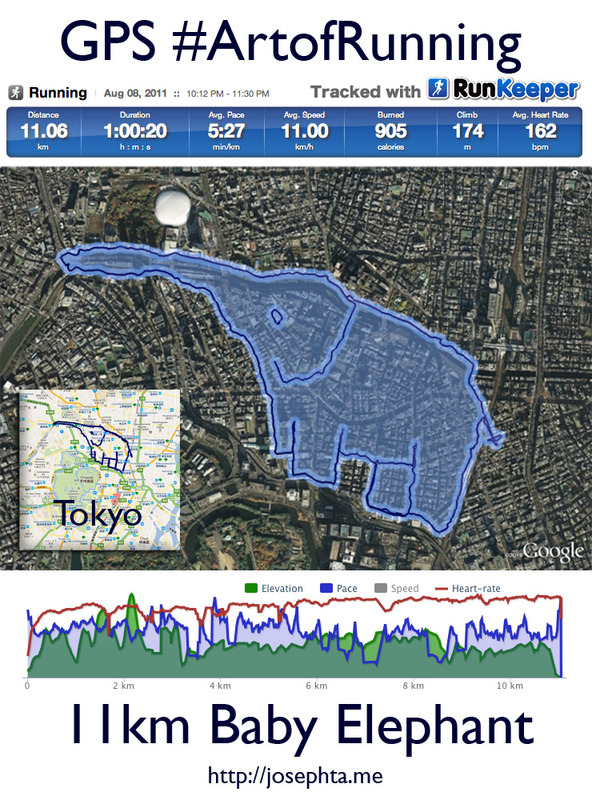 The original GPS and heart rate data can be found on Runkeeper. I really love your art of running images and am interested in putting together an article on the trend for paiting/drawing using running apps. It would be great if you got in contact to see if we could put something together. Send me an email and we’ll get the ball rolling. Dan, very happy to hear from you – have just emailed you!